Mr. McClain's 1991 Mustang GT dubbed, "Death Machine", is now highly modified. It features a race prepped, 750 HP supercharged 377 cid 5.8L stroker engine. Still in full street trim, and weighing 3550 lbs, it is street driven. "I love all performance vehicles, but especially Mustangs and my own 1991 GT. I purchased the car in 1991. I had already owned 3 others, and I had worked on and raced them all. However, I had never found the one I quite wanted though. A vermillion red Mustang with black interior. Finally, I sold my black 1991 Mustang GT and bought my current one. It was everything I had wanted. And well, you know, it stayed stock for about a week. Quickly I had lowered the car, installed a complete Flowmaster exhaust system, and installed a Nitrous kit. I had the car running 12.6 in the quarter mile within a month on eight inch slicks. Being into computers for a long time already, and just getting into the world of the internet, it didn't take me long to quickly learn all these amazing new online technologies. I started my small home page about my hobbies like a lot of folks, and of course, I had my Mustang on it along with some tech info and links. Already having a knack for this stuff and wanting to further advance my newly learned skills, I just kept at it. And, at it, and at it, and... wow, it just ended up taking on a life of its own. Today it [MustangWorks.com™] is a very large entity. The site now has thousands of pages, a slew of custom features, tens of thousands visit, and readers generate millions of page views each month. The thing is, back in 1995 was when everyone was just starting to discover the internet and get online. Especially Mustang performance and racing enthusiasts. So, I thought hey, there's not really any big place on the web for these people to meet up and communicate. Or, to get tips and tech advice. I had learned a good deal about modifying late model Mustangs and I thought I could help keep people from making some of the mistakes I did. Therefore, I guess my goal at the time was to build a website on the internet that could become an epicenter for us to communicate." MustangWorks.com™ operates on a dedicated server farm. And, that he did. When the site started as his homepage it attracted about five hundred page views a week right off the bat. As Mr. McClain worked on it, making it bigger each week it seemed, the number of page views grew exponentially. One thousand a week, five thousand a week, ten thousand a week, etc. Several months after the site was started, he changed its name to "The Mustang Works™", and totally concentrated on making it a Mustang community. 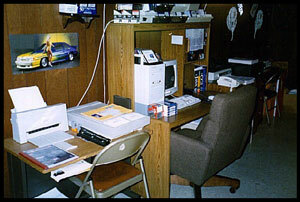 A year after it was started, in 1996, The Mustang Works™ was already garnering fifty thousand page views a month. Today, MustangWorks.com™ has been one of the larger Ford enthusaist and community sites since 1995. It lives on a dedicated, load balanced server farm and MustangWorks.com™ continues to receive tens of thousands of visitors. The site is still heavily geared towards the online Mustang enthusiast, which provides an excellent online information source and community for all who own and enjoy this American automotive performance icon. Learn more about the interesting history of MW and those who have been involved with it over the years by reading this forum post.